It’s truly a shame that such a talented artist like Ida Waugh seems to only live on through her artwork. Overshadowed in both life and death by her half-brother Frederick Judd Waugh and her father Samuel Bell, there’s little written information to be had on this American artist. And, as often happens when information is scarce, incorrect information gets repeated and spreads across the web. There isn’t much information about Ida online and much of it is offered in single sentences – a piece here, a piece there. Which means, my research did not provide a clean timeline of her activities, nor was I able to double check everything. Ida is the daughter of Samuel Bell Waugh and his first wife – Sarah Lendenhall. I have seen mentions of a sister – most do not include a name. Those that do, say her name was Amy. The writer Amy Blanchard became an integral member of the Waugh family. I can’t help but wonder if some have wrongly called the sister Amy too or if both Ida’s sister and life-long companion shared the same first name. Several biographies have mentioned that the sister was a talented pianist. Ida’s father was a well-known portrait artist. His most famous work is his portrait of Abraham Lincoln, done from life…meaning the President must have sat for Waugh. Frederick became a well-known nautical painter. Ida’s step-mother and Frederick’s mother was Mary Eliza Young Waugh, a miniaturist. I also saw several references to a paternal grandfather, who was also an artist. With a pedigree and family like that, it was little wonder Ida would become an artist. Ida was born on October 24, 1846; not in 1819 as is commonly repeated across the web. Her father would become her fist teacher. She studied at the Academy Julien and the Academy Delecluse in Paris. She was a student in the first “Ladies Life Class” at the Pennsylvania Academy of the Fine Arts in 1868 – a class also attended by Emily Sartain and Catherine Ann Drinker. This was an era when lady artists were often relegated to more lady-like subjects and painting men or models that were unclothed was frowned upon. This class would lead to a virtual revolution in the art world that opened up life classes to women artists in America. The classes were still, however, restricted to “lady’s” classes and often clothed models. It was a time that the art world was only beginning to accept that women were entering the profession and not simply dabbling in the arts until marriage. While still living at home with her parents, she first met Amy Blanchard. Amy was hired to be young Frederick’s tutor. Ida and Amy would become fast friends. They would work together, play together, live together and in the end, were only separated by Ida’s death in 1919. Along the way Ida and Amy would publish a small library of children’s books. Amy often wrote the text and Ida provided the wonderful illustrations. Ida also published a number of her own books. 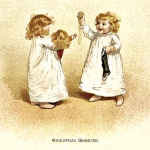 These books featured sweet-faced infants and children often with little else in the illustration. Though she would never marry or have children, she could capture the look of pure love that often passes between mothers and their children perfectly. She would also include flowers and a few animal drawings to further adorn the pages. Ida Waugh was not only an illustrator of children’s books, she was an award-winning painter as well. Her most well-known work, “Hagar and Ishmael” was shown in the French Salon in 1888. Her portrait of Dr. Paul J. Sartain won the 1896 Norman W. Dodge prize at the National Academy and was shown in the 1901 Pan American Exposition. 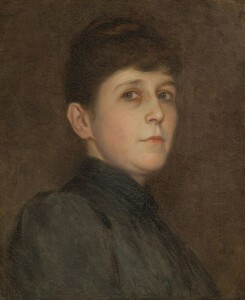 Her work was also exhibited in Philadelphia, Cincinnati, Chicago and New York. Prang, who published greeting cards, held an annual contest and Ida Waugh was listed among the winners. (I could not find a date or an example of her entry.) In the late 1890’s, a number of her illustrations from When Mother Was a Little Girl were made into chromolithographic postcards. She was also employed by the New York publishing firm McLoughlin Brothers. Waugh and Blanchard had a number of homes and enjoyed an almost bachelor-like lifestyle. They liked to go out and were somewhat known for their beer drinking. From what I’ve read, it would seem their favorite home was their summer home on Baileys Island in Maine’s Casco Bay. Most articles had the two ladies living together, one said they had homes side-by-side. Reusable Art has acquired over 100 examples of Ida Waugh’s art. Most of them are images of children, babies and their mothers. There are also a number of flowers and animals to explore too. In time they will all be included in this special image category. Sleds and skates, may be the two greatest symbols of fun in the wintertime. 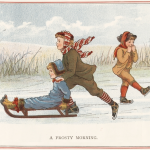 Showcased in this vintage drawing of 3 children gliding and sliding on the ice. Sweet little, vintage drawing of a sunset over water with seagulls and a sailboat. 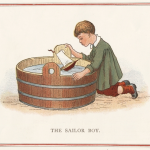 Charming vintage drawing of a sailor boy, his toy boat and a tub full of water. Does he dream of grand adventures or racing his boat with his friends? 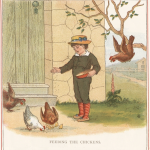 1892 drawing of a little boy feeding chickens. A trio of chickens, several chicks and a flying chicken will be enjoying the feast. 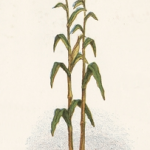 Vintage corn stalk drawing from the late 1800s. It was part of children’s book and now can be part of your own creative projects. Charming little drawing of a village scene from a children’s book from 1892. Lots of green grass and trees under a blue sky. 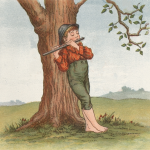 Charming Ida Waugh drawing of a little flute player from an 1892 children’s book. 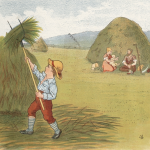 Vintage children’s book illustration of a family during the hay harvest. A child stacks hay while his mother, father and younger sibling look on. 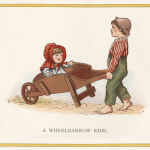 Charming drawing of a brother giving his little sister a wheelbarrow ride. Vintage drawing by the American illustrator Ida Waugh (1846-1919). It’s Christmas morning and it’s time for opening the stockings. Drawing of a child showing another child and her dolly the great treasure she has received. 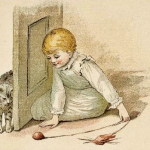 Playing with kitty is a charming illustration of a young child playing with a cat around a door with a ball of red yarn. It is the work of Ida Waugh.